I like that in the same paragraph they write “it is so completely impossible to grasp the basis for the weird ideas and beliefs” they also write “Religion is practiced as it was, originally, thousands and thousands of years ago.”. It implies that Hindu beliefs are weird, yet the second sentence would bring howls of dirision from Young Earth Creationists, who’s ideas are of course perfectly normal. Buffalo chips once served as fuel in this country. Cow dung has many uses — besides that of a fertilizer — in the Far East. SOME of the most peculiar customs in the world originate in India, where beliefs and religions have flourished from ancient times, without any change from contact with the civilization of the rest of the world. To the average traveller, India presents a glamorous and fascinating study, inasmuch as it is so completely impossible to grasp the basis for the weird ideas and beliefs which are firmly fastened in the Oriental mind. Religion is practiced as it was, originally, thousands and thousands of years ago. Even the higher castes of Indians, or Hindoos, many of whom have had western university training, still revert to the beliefs of their ancestors. 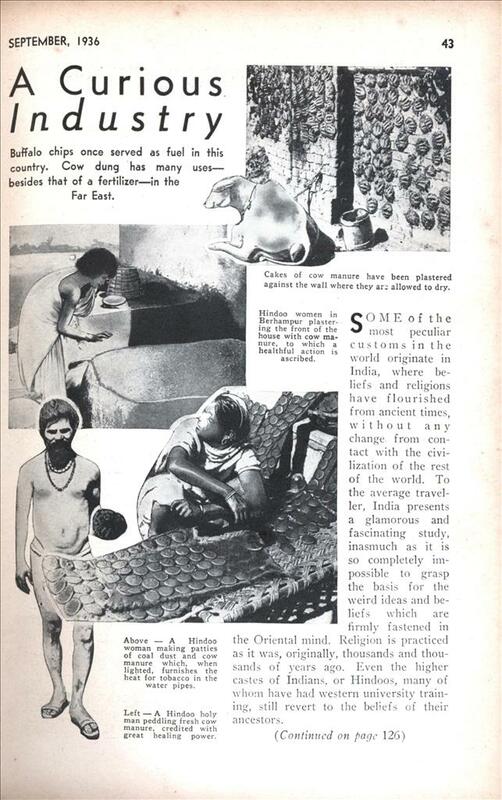 One of the strange objects of worship by the Hindoo is the cow. To him, the cow is a sacred animal, and everything emanating from it is equally sacred. The cow is endowed with fabulous powers of healing, of protection, as well as human qualities. From this belief originates the strangest industry the world has ever known. The excrement of the cow— cowdung—is therefore also held in special esteem by the Hindoos, as it comes from the sacred beast. They utilize the cowdung for a variety of purposes—such as fuel for heat and fuel for tobacco for water-pipes, remedies, wall plaster and many other things. The dried cowdung is believed to have all types of healing and protective qualities and is supposed to be good for whatever ails you. And so, in India, at any rate, it can be said that gold lies in the streets. Uhm…what? Where does this come from? Do you know what a “young Earth creationist” is, or are you parroting others’ intolerance? Why do you imagine it would bring howls of any sort, derisive or otherwise? Indian religions HAVE been practiced for thousands of years with little change. Even the most literal of Biblical readings, from whence come the young Earth theories, leave plenty of time for the thousands of years of civilization spoken of here. Don’t sully this site with needless hate, please: I love it too much. 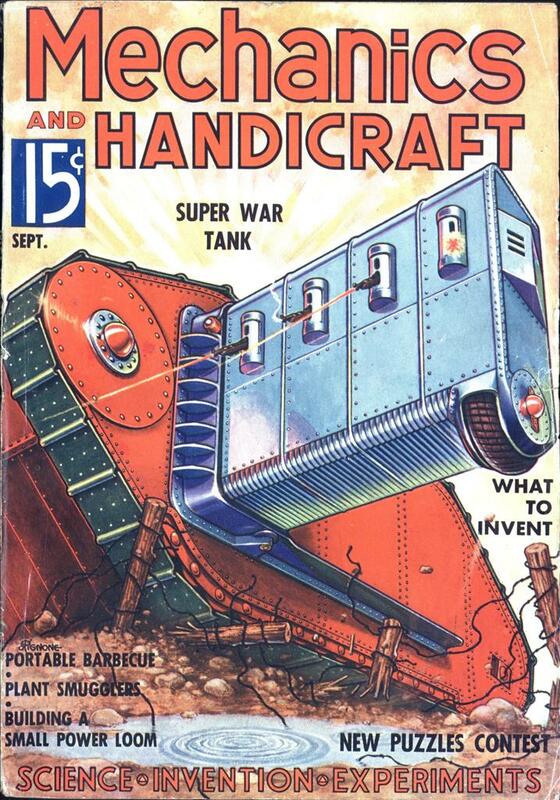 Let the marvelous time-capsule articles stand on their own merits. Disclaimer: I’m not a troll or a YEC myself. I just have a low tolerance for ill-informed bashing of any stripe.